I went through my 'extremely-way-too-large' scrap pile and found a ton of fun colors. I cut them all 5 inches in length but the width of each one varies. 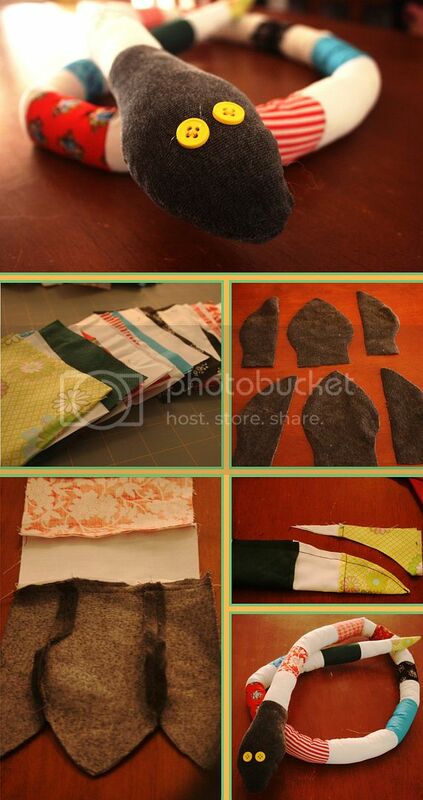 Sew all of the pieces in one long line. I just free handed the pieces for the head and sewed them onto the body. I then folded the snake in half and sewed a seam down the entire length of the head and body. Be sure to angle the last few inches in order to make a point for the tail. Leave the mouth open so you can turn him inside out. Once you sew the eyes on and stuff him, hand sew the mouth shut. I made this two weeks ago and so far all of the girls' socks have stayed in the sock drawer.